Shelby Huey was born in Jackson County, AR, on February 22, 1946, the 4th of five children to Raymond and Elsie Huey. He graduated from Grubbs High School in May 1964 and joined the Army in August 1964. Shelby finished basic and AIT at Polk then went to Fort Benning for Jump School. After completing Jump School he went to Okinawa where he was assigned to 173rd ABN Brigade. The Brigade was ordered to Vietnam in early May 1965, the first Army unit deployed for combat operations. After the one year tour he returned stateside to Ft. Campbell KY. There he finished my 3rd year with the 101st. He was discharged and returned home to AR. About a year later he reentered the Army at Ft. Campbell. From there he went to Ft. Jackson SC for Drill Sergeant School. 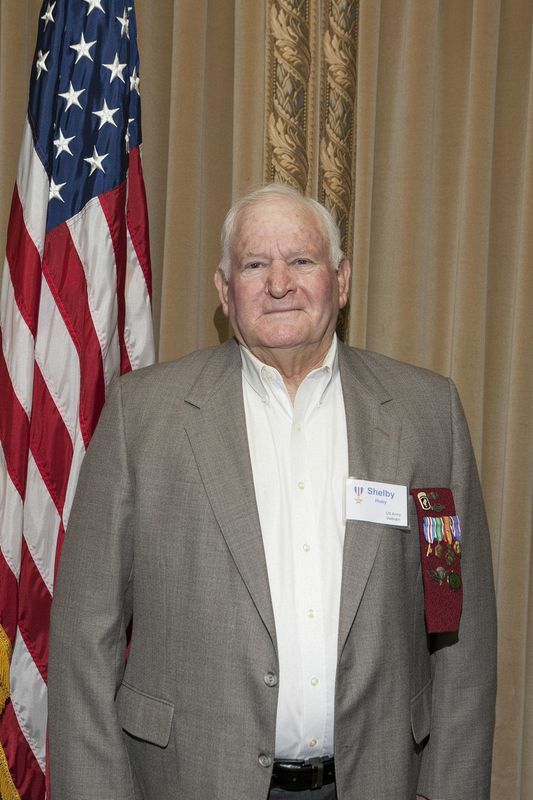 A year later he returned to Vietnam as an advisor to the Vietnam Airborne Division. In Jan 1970 the Vietnamese Airborne Division and the 1st brigade of Vietnamese 1st Division was ordered to invade LAOS to disrupt the supply line flowing down the Ho Chin Men trail. Shelby’s unit was ordered to provide security for the 1st brigade at fire base Tango Bravo. This fire base was 1/4 mile from the Laotian border. Fighting intensified from day to day. The fire base received 3 to 4 hundred artillery rounds a day. Small arm fire was almost constant. Being the only American on this little one acre of hell he became very lonely. Shelby also knew that sooner or later the NVA would find that there was an American on the firebase and he would be a real prize. The fighting continued for another week and half. Five days before abandoning the fire base, his Bat boy "radio" and special equipment guy was ordered by his company commander to help man an observation post about 200 meters outside the wire . This was very dangerous place as the NVA were closing in closer by the day . He did not want to go so Shelby told him if he got in trouble he, Shelby, would come get him. If not for close air support Shelby didn’t think anyone would have survived. During the morning of Feb 9 1971 the NVA were pressing their attack from 2 directions. Shelby heard his bat boy calling for immediate assistance. Then Shelby heard the shell burst that took his leg and the lives of two men. Shelby took three NCO he knew to be loyal and fearless. They went out to check on Shelby’s little friend. After about an hour and two very sharp fire fights Shelby and his team approached the fox hole that was the listening post. They found the two dead soldiers and Shelby’s guy still barley alive with his leg blown off between the hip and knee. They took time to give him two morphine shots and a tourniquet. Since Shelby was the biggest of the four man rescue team, it fell on Shelby to carry him back to the fire base, keeping his promise to come and get him. They made it thru the wire and got him medical attention. It took about four hours to get a medevac to take him out. The operation lasted several more days but this had to be the longest. When the South Vietnamese were ordered to withdraw, the word was slow to get to Shelby’s men. As a result of this delay they were cut off. Very savage fighting took place over the next two days. Shelby and his men finally broke out and got to route 9 only to be ambushed. After breaking this ambush, they were hit again. With the help of a company of Vietnamese Marines and their American advisor, they broke through and made the NVA pay a very heavy price. It took four days to cover 12 KM to reach Khe Sahn. For his gallant efforts saving his bat boy Shelby received the nation’s third highest valor award, the Silver Star and the Vietnamese Government awarded him the Gallantry Cross W/ Sliver star. The Airborne division returned to Saigon and Shelby returned to the states.